While in Barcelona we rented a car for the weekend and said hello again to the freedom of going where we want and when.The first day we spent going to Parc del Laberint d’Horta (a labyrinth park), the Temple Expiatori del Sagrat Cor (which is a Roman Catholic church on the summit of Mount Tibidabo) and then stopping at the beach. I was really excited to see the two beautiful spots, but really I was just thrilled to get to the beach! 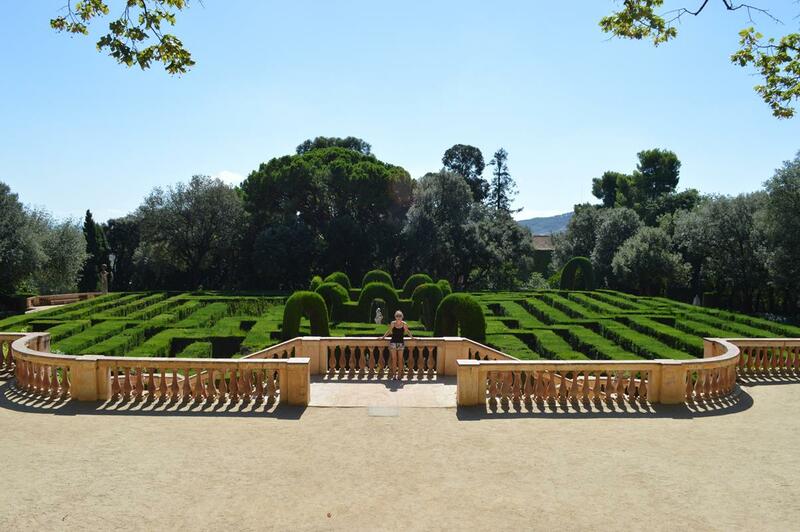 Parc del Laberint d’Horta was only a couple euros to enter, and it was a small but cute park and labyrinth. We did actually get lost in the labyrinth for a few minutes, only because I was leading the way and I know I’m bad at directions! If you look up pictures of this place, it looks awesome, like something you’d see on top of Minas Tirith awesome! Unfortunately I can only tell you it looked pretty decent from far away, because due to the lame traffic for the amusement park surrounding it we weren’t able to drive all the way to the top. I’m sorry Sagrat Cor, but nothing comes between me and my beach time! Let me tell you something about a lot of the beaches in Croatia and other Balkan countries… the beaches are rocky. Gasp. I know. I didn’t think I would care really, but once we got to the beach in Barcelona and I felt the sand between my toes and throwing it around I realized I deeply love sandy beaches. I seriously just floated in the water for 20 minutes straight and was so satisfied with the knowledge that I could step on the ocean floor and not feel sea urchins or rocks jab my feet. I was sad to leave only after a couple hours and know that I must have been a fish in a previous life. 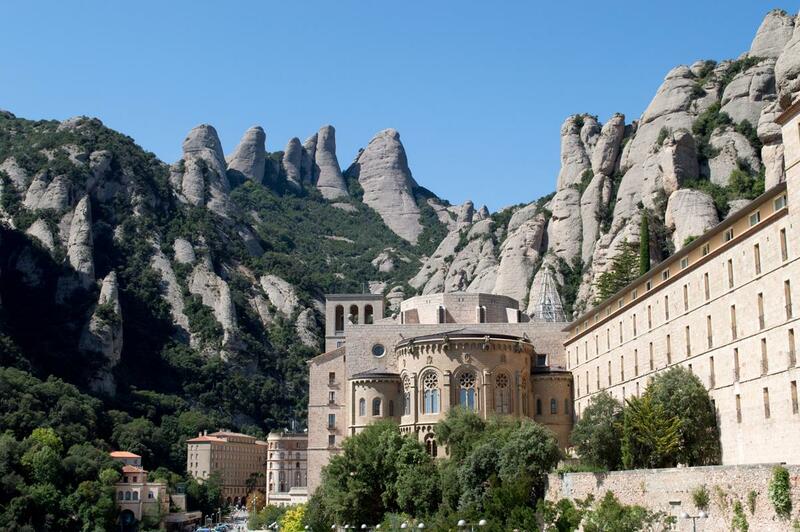 On Sunday we first drove to Montserrat, a mountain range that cradles the famous Montserrat Monastery and Basilica. The Monastery and Basilica are known for their world renown art and Virgin Sculpture that tourists wait hours to see- the line was at least 2 hours when we were there so of course we weren’t waiting. My favorite part was seeing the incredible mountain ranges and I loved how the monastery just sits inside of it. The view alone made the drive worth it. After visiting Montserrat, we headed to Andorra to explore. We’d heard that Andorra is a great place to shop and people from Barcelona travel there for clothes like SLC people head to Evanston for fireworks. We realized quickly there wasn’t much to do in Andorra though, a lot of places were closed on a Sunday and instead we looked for places to eat and listen to the out of place Mariachi band playing in the street. We had some delicious veal burgers and thick fries with a yummy sauce. Once we were in Andorra and talking of what to do next Pablo couldn’t help but notice how close we were to France. I told him we’re going to Paris in only a couple weeks and what would we see in a small town? 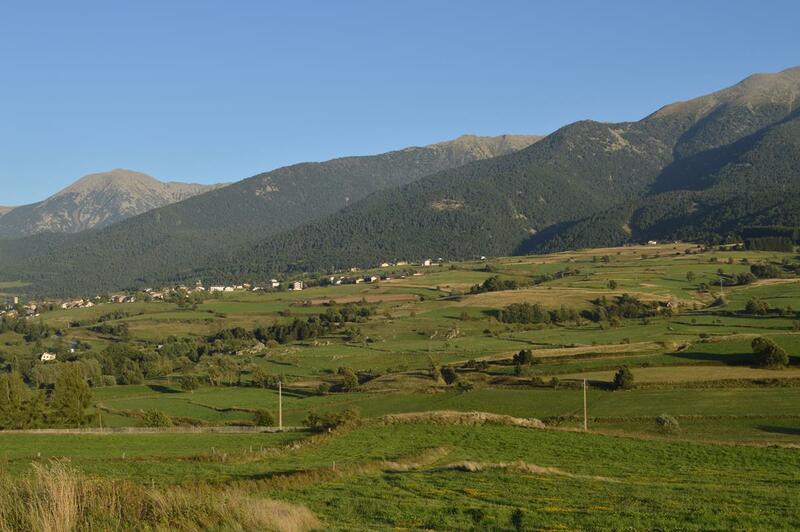 He pointed out that there was a UNESCO site just an hour away from Andorra called Mont-Louis. I don’t like to pass up another UNESCO site when it’s close enough so we headed out to France. Mont-Louis is the highest fortified town in France that has served it’s purpose in protecting the territory and is now used as a training unit. Since we arrived late in the day and on a Sunday the walking tourist area wasn’t open and the guard told us to go away. We walked around the fortification and realized there probably wasn’t a lot to see anyways. The car ride during the whole trip was the best part of it all, which is good because it was also the longest part! I love Europe’s countryside with fields of green, hay bales, little houses, and animals like cows and sheep scattered everywhere. There’s not much to do in the towns that we went to, but they’re fun to see. I would make a very notable piece of advice if you’re planning to travel the same route we did; DO NOT take the route that has the tolls (it will tell you on google maps). There are two routes, which take pretty much the same time, but the one with tolls is slightly shorter. We went the route without tolls on the way to Andorra and then decided to come back the slightly shorter way that has the tolls (don’t know why). We ended up paying just under €25 just in tolls for the trip back! It was ridiculous and that would’ve paid for another day to rent the car. The toll is to pay for the small tunnels that were put in, and it wasn’t worth it, trust me. We noticed while in Spain and driving through to Andorra and France that the Catalan flag hung on houses and stores. The Catalans forms a historic nationality that consists mostly of northern Spain (as well as part of Andorra and France). We learned on our trip to Spain that it’s an existing nationality and one that many families and communities still support. Many people seemed to be speaking Catalan, but they would easily switch to Spanish when Pablo started talking to them. We heard from locals that the language Catalan isn’t taught in schools, but kids still grow up hearing it in the home and in the community. When Spain took over the area, Catalans weren’t allowed to fly their flag. Instead Catalans flew the Barcelona soccer club flag because inside of it is the Catalonia flag. It was their own way of rebellion and showing their pride for their culture. Would you drive an extra hour or two just to dip into another country? Sorry we missed your comment! What did you end up doing? We enjoyed both for scenery. You see a lot more country side going to Andorra. I ended up doing neither and went to Sitges for the day instead!